We've got the sun in the mornin', and the rain in the afternoon. Swing music aside, that's been the last couple weeks here in semi-sunny South Florida. When it rains, it's been Biblical. Entertaining to watch, it's wreaked havoc with our Rack's day. Dogs just don't like "weather", especially Flashbangs that the local constabulary would love to have. Lightning strike within the block will curl your hair, even if you're bald. But, that silver lining? It's mosquitoes. They hatch. So since it's 10 degrees cooler when the clouds come in, and another 5 or so when it's raining, you've got on jeans to protect yourself from the little disease carrying blighters. The sun rises, and everything comes out the next day. Keep hiding. The bats have gone overhead to try to put a dent in the overpopulation of the same tiger mosquitoes that are as far North as New Jersey. Nasty aggressive mosquitoes. However... there's a savior. A rather beautiful creature. They dance on the air. Perch on the very tips of leaves. Their hatching is timed to take advantage of the rains and the mosquitoes' birth. Step out into the sun and there are dozens of them. Hovering on the breezes, then darting forward for a morsel, they are the Dragon Flies. Literally 100 of them on my front yard the other day, all facing into the afternoon sun, they watched as I stepped out onto the porch. Rack on his long purple leash, there was a ripple effect. My bouncy dog, bounded onto the grass. A wave of disturbed insects lifted gently out of the way with the same pattern I get when I make my bed. A rise and flick like an amber colored translucent fabric shimmering in the sun, they launched to get out of the way of the kinetic motion of the black and white dog. The cloud of dragon flies lifted, then landed further out onto the green grass and set back to the business of keeping the insect population down. 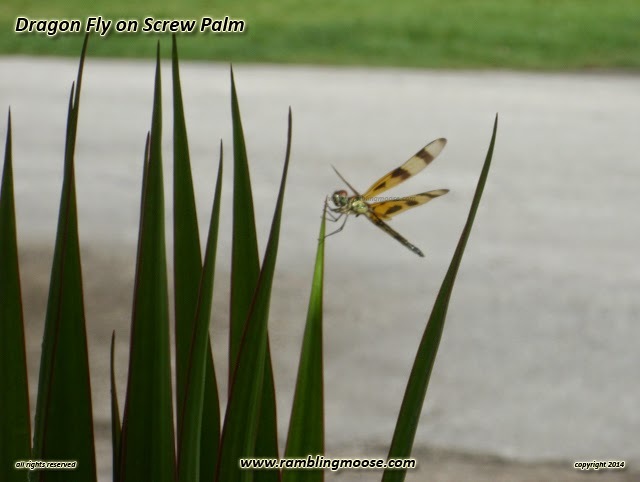 One of them had landed on the screw palm in front of the house. It stayed there long enough for me to grab the camera and ineptly take pictures on the internal memory by mistake, then to retrieve the chip and take a few more there. It was happy to oblige, seemingly willing to be photographed "like one of your French Girls". Posing, reflecting the sunlight, and shimmering in colors both subtle and changing, it had decided that I had had enough pictures and launched. Gliding on the air, it left us to ponder its existence for another day.